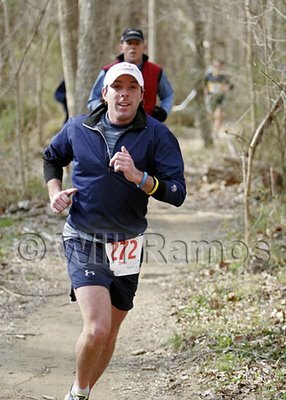 Here are 2 pictures that were taken of me at the race on Sunday. The first one is me looking pretty good almost half way through the 5.5 mile course. 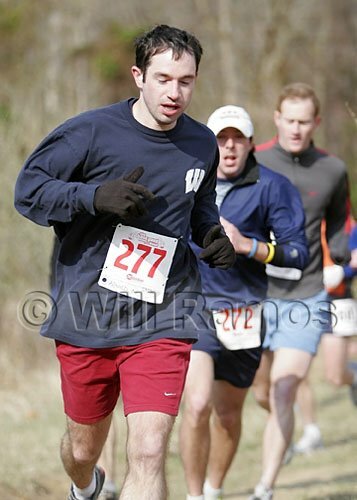 I got caught behind a guy in this one. (It isn't even a good shot of him... And he beat me by 3 minutes...) I will have to make sure that I spot the photograph, position myself better, and SMILE! the next time. The first one was much better, except for the guy right behind my head. Thanks Teen! The shins paid for it, but as long as I looked good! I amnot sure I can make up 3 minutes, but we'll see!